Your vision is unique. Not content to settle for what everyone else is doing, you’re curious, inventive and willing to take risks. Whether your passion is for narrative, documentary, music videos or experimental film, the UArts Film + Video program will help you transform your vision into reality. You’ll learn about every aspect of the business from active professional filmmakers, including an Oscar nominee and recipients of the National Endowment for the Arts, Guggenheim and Sundance fellowships, whose work has been screened on PBS, at the Whitney Museum of American Art and at the Museum of Modern Art in New York and in festivals around the world. You’ll collaborate with other students – writers, actors, dancers, musicians, costumers and set designers – in a city bustling with film productions, both Hollywood and independent. You’ll use the same high-tech equipment the pros use, including Black Magic cameras, a variety of digital editing systems in our state-of-the-art digital imaging and editing labs, and a purpose built, acoustically isolated film-shooting studio. In addition to creating your own films, you’ll do an internship, maybe on a film or TV show being shot in Philly – like “Silver Linings Playbook” and “Creed” – or in New York, Los Angeles, or abroad. A class assignment might take on a city-wide film competition and the UArts entries will sweep the awards, as they did with a contest sponsored by the Opera Company of Philadelphia. Or you might find yourself collaborating via the Internet with film students from the Royal Conservatoire of Scotland, in Glasgow. You’ll have study abroad options in England, Australia, Ireland, Finland, South Korea, Scotland, New Zealand and Italy. And in addition to exploring Philadelphia’s vibrant film and art scene, you’re only two hours from New York’s galleries and museums showcasing contemporary film and video. 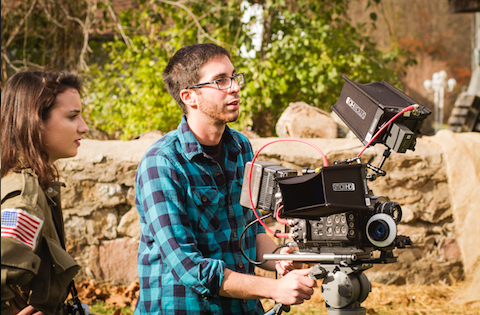 This major provides students with a background in all phases of media production, including digital cinematography, sound and image editing, lighting, and sound/image manipulation. Film + Video students acquire a strong background in criticism, theory, and the history of media and take advantage of a wide range of internship and study abroad opportunities. Complete 18 credits of free electives. This requirement is satisfied by any undergraduate course that isn’t required by the program.